Over eighty museums and more than two thousand monuments -both historical and artistic-, contribute to the city’s richness and bear witness to the history and the art of all those who have populated Madrid throughout the centuries. Without this cultural heritage it would be impossible to understand European and world history. 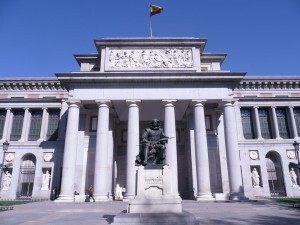 Madrid’s cultural legacy offers visitors an unprecedented tour: the Art Walk (which includes the Prado Museum, the Reina Sofía National Museum and Art Centre, the Thyssen-Bornemisza Museum and, more recently, CaixaForum). It is a unique walk through painting, sculpture, architecture and nature. But cultural heritage can also be appreciated on the streets. A walk through the many sides of Madrid offers a survey through past eras: the Hapsburg dynasty, the Bourbons, the Middle Ages, the 19th Century and even the times of Goya or Velázquez. 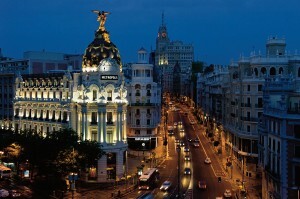 With almost 3,000 hours of sun per year, Madrid is undoubtedly a luminous and warm city. Its Mediterranean continental climate is an invitation to walk through its streets. There is a great number of parks throughout the city, making it the greenest capital in Europe. In fact, Madrid has two true “green lungs”: El Retiropark and Casa de Campo. 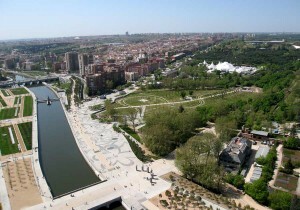 In addition, the ongoing Madrid Río (Madrid River) Project will transform some 820 hectares into a fluvial park by 2015. With over 3,000 restaurants, Madrid can be considered a city where one can taste all the different cuisines in the world, as well as Spanish dishes. Undoubtedly, it also shows the richness of its own gastronomy with the cocido madrileño as its undisputed representative, while offering plenty of opportunities to try tapas. Aside from traditional flavours and styles, there is a new trend of top-quality cuisine, referred to as “designer’s” or “author’s” cuisine, which is considered avant-garde gastronomy to satisfy the most exquisite palates. Madrid hosts over 4,000 congresses and conventions every year. There is a wide range of venues on offer, which include Feria de Madrid trade fair grounds (Ifema) and the future International Convention Centre to be opened by 2013. Furthermore, the excellent communications -such as Madrid-Barajas International Airport-, its top-quality hotels, and its significant cultural and entertainment offer will surely make the organization of any business event a clear success. Business tourism in Madrid has found a great support in Madrid Convention Bureau (MCB). This organisation was founded in 1984 by the City Council in collaboration with several public institutions and private companies at the time. It promotes business tourism, convention bids and incentive travel. Shopping in Madrid appeals to everybody for its variety, its quality and for the multiple alluring choices offered: from the most modern premises to the old traditional shops in the city centre. The city has several well-defined shopping areas: Gran Vía, Calle Preciados, the Azca-Orense area, Chueca and Calle Fuencarral, Calle Bravo Murillo or the historical city centre. However, it is in the Salamanca neighbourhood, particularly on Calle de Serrano and its surroundings, where one can find the major boutiques, luxury jewelleries and gift shops. A visit to El Rastro is a must, as it is one of the world’s most famous street markets. This experience is more about seeing than buying and, of course, about being seduced by the most traditional side of Madrid. The city of Madrid is an unbeatable place to search for the essence of luxury and exclusiveness, offering the best in terms of accommodation, gastronomy, shopping and entertainment. Visitors will be able to enjoy a choice of five star hotels -from classical standards to the most avant-garde and minimalist fares-, prestigious restaurants donning Michelin stars, private visits to world-famous museums or shopping at renowned national and international luxury firms located on the Golden Mile. Sports are intensely lived in the city and there are a large number of specialised facilities to practise any discipline as well as to watch the best sports professionals. Madrid hosts football and basketball games featuring its most international teams -Real Madrid and Atlético de Madrid-, and holds important sporting events such as the Madrid Master Series, the Madrid Golf Open, the San Silvestre Vallecana Race or the Sports Day. All this information and much more can be found at www.esMADRID.com.